French couturist Jean Paul Gaultier expands his material choice for design to include metal — not the precious kind, but the Coke can variety. 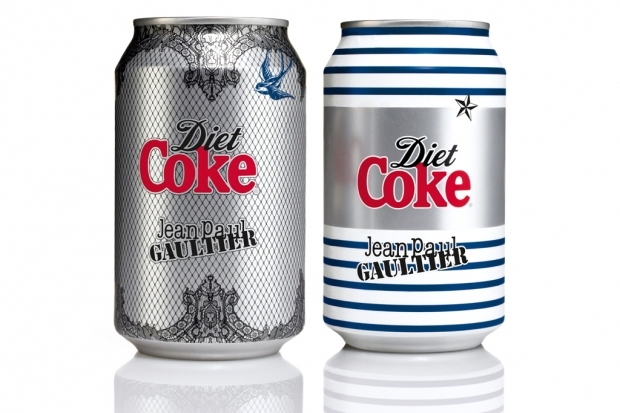 The exclusive Diet Coke by Jean Paul Gaultier special edition collaboration with its “Night & Day” iterations unveiled a third Tattoo-inspired Diet Coke bottle design only recently, now followed by these special edition Coca-Cola light/Diet Coke cans. To dispel confusion, Coca-Cola light is simply Diet Coke’s alternative label in countries where “diet” is not used to describe low-calorie drinks. This is the first time in the beverage brand’s history that a design collaboration has been translated onto the 330ml cans. The ‘Night’ can immortalizes Gaultier’s iconic corset and cone bra design in classic glam rock fashion while the ‘Day’ can stands inspired by his signature Breton blue and white stripe motif. These cans are available across Europe at select retailers until September.